Two Agriculture Department officials were killed and 3 wounded Friday morning when a vehicle belonging to the department, transporting fruit plants, was hit by a Sri Lankan Deep Penetration Unit Claymore mine blast around 8:45 in Nedunkerni, 37 km northeast of Vavuniya. One of the two Claymore mines, triggered by the DPU attackers, exploded. Sri Lanka Army launched an artillery attack, firing around 25 shells were fired towards the attack site, after the Claymore explosion. The officials killed in the Claymore explosion were identified as Tharmalingam Ganesalingam, 59, father of 3 and Vetrivel Mahendran, 52, an agriculture education officer and a father of 3. Two of the wounded, identified as K. Kurukulasingham,53, and Sithiravelautham, the driver, were rushed to Nedunkerni hospital and transferred to Vavuniya hospital in critical state. The third victim, with minor injuries, was treated at Nedunkerni hospital. The officials and driver had come from the Sri Lanka Army controlled Vavuniya town Thursday and were transporting fruit plants from Nedunkerni towards Nainamadu when their pickup vehicle was attacked at Iyan kovilady, Nedunkerni Prathesa Sabai officer S. Paranthaman said. The vehicle, with registration number 53-0904, was completely destroyed in the attack. Nedunkerni hospital has limited facilities as the only doctor, Kathirkamathamby Jeyamalina, his wife, driver and two nurses were killed, when DPU attacked their ambulance on August 09. 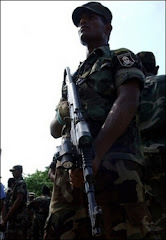 The claymore mines were placed by a deep penetration unit of the Sri Lanka Army troopers who were believed to have come from Padaviya in the north of Anuradhapura district, Tamileelam Police offcials in Kilinochchi said. Nedunkerni is located in Liberation Tigers of Tamil Eelam controlled area in Vavuniya district.